Your first step is finding the perfect kale. Look for kale that has crisp and dark greens. When you are ready to prepare, rinse the kale in a large bowl of warm water and drain. Trim away any tough stems. Roll the leaves in a jellyroll style. Slice the rolled up leaves into strips. The strips should be about 1/2-inch thick. In a large skillet, heat 1 tablespoon of olive oil. Once your oil is hot add the kale and cook for 2-3 minutes or until the leaves are tender. 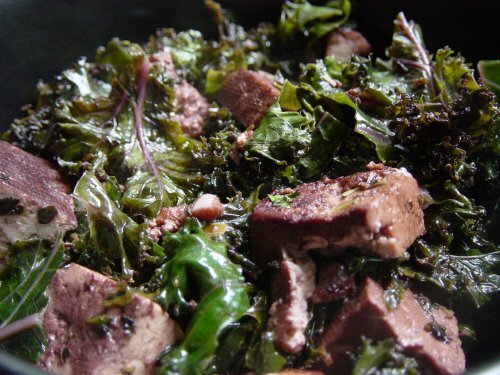 Pork ribs are a great addition to kale. Many people like sprinkling sausage into the kale for a healthy breakfast. White wines go perfect with kale or any green vegetable. Not only is kale beautiful to look at, it is also healthy. Kale has proven effective in lowering cholesterol. Kale can also lower blood pressure and is a great low calorie food.